On February 16, Muslims of Talekhan village, Lingsagur Tehsil, Raichur District in Karnataka had gathered for the Jummah namaz in the afternoon when members of RSS barged in and beat up the worshippers and drove them away. 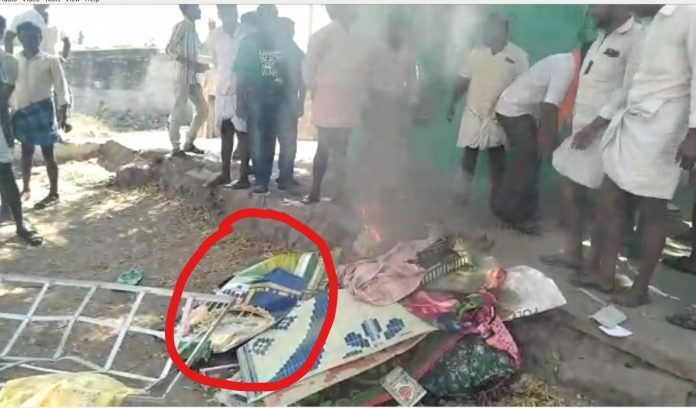 Then, the miscreants set fire to the prayer mats, the green flags of the adjacent dargah, wall posters of Kaaba and other materials inside the mosque. They even beat up some of the villagers who tried to stop them and filed a complaint with the police alleging that they were celebrating the Pulwama bomb blast and raised Pro-Pakistan slogans. perpetrator Organizational Right Wing Hindutva Was cross FIR filed Yes :An FIR was filed against the 6 accused under sections 143, 147, 120(A), 124(A), 504 and 149 of the IPC. The mosque stood on Wakf property so the Wakf board filed an FIR against the perpetrator but the police mentioned the perpetrators' as 'unknown' even after evidence showed their faces clearly. Charges Filed Other details The bail petition for the accused was filed on March 5th and is now scheduled for hearing on March 25.
judgement Reference other information A petition was filed by the Hindu Jagran Vedica group for the release of the perpetrators.